MINSK, BELARUS--(Marketwired - Jan 24, 2017) - The recently unveiled Minsk Marriott Hotel was honored this year with the prestigious recognition of being named Best MICE Hotel with a victorious debut promoting its new facilities for business. The ceremony, honoring the best in business travel and MICE, BBT Awards Russia & CIS, was hosted in the Moscow Marriott Grand Hotel. Taking place in Russia for the first time, the awards ceremony brought together more than 150 participants among TMC, MICE agencies, airlines, hotels, payment systems and Internet services. 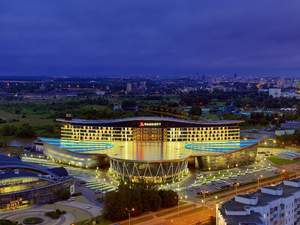 The popular Minsk Marriott Hotel has been participating actively in promoting Minsk as a new MICE-destination since its opening in May of 2016, within a high-end multifunctional complex designed to usher in a new era of business and commerce. The complex, which features the only international five-star hotel in Belarus and the sports and entertainment center Falcon Club, is the result of a cooperative partnership between Qatar and Belarus. The ambitious investment project which was the result of Qatar Armed Forces and the Belarusian Government working in cooperation, began in 2012 to increase the popularity and attractiveness of the Belarusian capital. During its seven months of operation under the asset management of the Vivat Investment Management LLC, the Minsk Marriot Hotel has taken part in various workshops and hosted numerous FAM-trips from Russia, Turkey and the Middle East. Since opening, the complex itself has broadened new tourist markets throughout the city, leading to the hotel's recognition at this year's awards. The professional jury of the contest, which included the most influential buyers of business-travel and MICE-services, highly ranked the services offered in the new hotel, including its 217 guest rooms with river and city views, Universal Falcon Club arena for up to 3,000 people, eight meeting rooms, ballroom for up to 600 people and multifunctional event room, professional catering team and proficient event managers, plus its Marriott Rewards® program. The Minsk hotel also successfully hosted a number of large-scale events including the 2016 Rhythmic Gymnastics World Cup, as well as the IX Congress of Oncologists and Radiologists of CIS & Eurasia. Bolstering the city's business, and providing a welcoming refuge for visitors, the hotel is a beacon of luxury in a vibrant destination. Discover our Winter Special, Meet in Minsk. For more information, or to book a stay at the hotel, guests can call +375-17-279 30 00. The Minsk Marriott Hotel offers sophisticated accommodations, service expertise and an easily accessible location in the capital city of Belarus. The hotel is conveniently located close to the city center, steps away from both the main exhibition center and exciting Minsk Arena. Each of its beautifully appointed hotel rooms and suites provide peak comfort, many with private balconies and river views, and all including free Wi-Fi and luxurious bedding. Spa-like showers and 24-hour room service help guests feel at home throughout their visit. Savor a meal at Fornello, the signature restaurant, or sample a hand-crafted cocktail as you nibble on tapas at the Barrel Bar. If you're hosting an event in Minsk, you'll be delighted with the hotel's expansive venue spaces, professional planning staff, and delicious on-site catering. The hotel also offers a peaceful spa. The Minsk Marriott Hotel at night, with the stunning city skyline backdrop.